The boiler is designed for heat generators in municipal boiler plants and in industry. Biomass combustion has its pitfalls, though. Biomass-based “clean” fuel has become very popular, in particular pellets and briquettes which are in fashion today. Upon the launch of such projects, however, their price relative to their calorific value has come close to the prices of natural gas. These prices will probably increase with higher demand, given their low humidity, high calorific value and relative comfort with this type of fuel. In spite of that it is a positive shift from the supply of natural gas to domestic energy sources and also with regard to environmental impacts. The buyer of pellets and briquettes pays not only the price of the biomass, but also the energy used to process them to acquire their final form. The question is whether there is a cheaper alternative. VESKO-B boilers, for example, could be an answer. These boilers are specially designed for the combustion of wood waste which cannot be otherwise used for industrial purposes. Bark, wood particles, waste, saw-dust, straw or chips can all be combusted. Unsorted waste is also incinerated without problems thanks to the extremely good through-flow capacity of the boiler´s transport routes. Without stopping or damaging the boiler, a brick, stone or other similar waste can pass through these routes without problem. The boiler´s tolerance against fuel humidity is also high. The boiler parameters are designed for 50% humidity. The boiler, however, also combusts fuel with 70% humidity. According to operators, it is common in winter that fuel is supplied to the boiler in frozen state, together with snow. The fuel is pushed towards the burning grate by a heated tunnel, thanks to which it is pre-dried. The VESKO-B boiler has a self-supporting, entirely welded box construction. 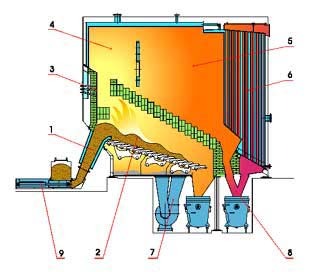 The lower part of the boiler is formed by a furnace chamber with an inclined sliding grate. The grate is controlled by a hydraulic mechanism and is cooled by conditioned primary air. A pressurised section is placed on the furnace chamber. The boiler is furnished with thermal insulation and is covered by a steel sheet with a plastic cover. The fuel is conveyed to the boiler by means of a hydraulic fuel charger. The fuel is pressed through a heating tunnel (heating by hot water) and is pre-dried before getting to the burning grate. The boiler is equipped with control automatics which can run in an autonomous mode (without the use of a parent computer) or in a mode controlled by the central computer of the entire boiler plant. VESKO-B boilers burn biomass on sliding grates. There is a suitably shaped vault above the boiler which induces a counter-current arrangement of the combustion products, which helps to reduce the time for the drying of the fuel. This construction of the furnace chamber, along with the use of a fuel transport by means of a hydraulic discharger with a large through-flow capacity, makes it possible to burn wooden material of a lesser quality produced during wood processing in sawmills, or during lumbering, forest works, etc. It is a mixture of sawdust, clippings, bark, wood chips, shavings, etc. The system of fuel feeding corresponds to the type of the used fuel. The biomass is transported from the fuel stocks to the vertical interim storage, from where it is transported to the furnace chamber of the boiler by means of the hydraulic fuel charger. The inclined grate, the shape of the ceramic vault, and grate ash falling to the ash container without having to crush the slag permit the burning of very fusible materials. The large after-burning chamber with proper inclination of the vault eliminates up to 40% of the escaping light ash. The vertical orientation of the fire tubes of the exchanger prevents the coating of the exchanger with drifting light ash, which is led off from the reversing chamber into the container. The transport routes of the fuel consist of a complex system of feeders with a lineal reversible motion caused by hydraulic cylinders. The complete route has a large through-flow capacity (minimum cross-section 1,200x280mm). The transport route is not inclined to blockage (screw feeders or turnstiles, for example, are not able to transport uncrushed bark, and they are inclined to become blocked through the influence of the chords of uncrushed bark). The transport routes can transport even a large percentage of non-combustible admixtures (rocks, pieces of steel etc.). 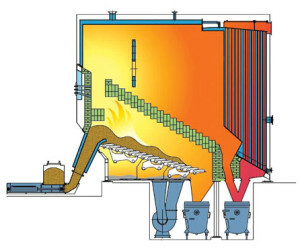 Grate ash falls into a container which is connected by a special mechanism directly to the boiler; together with the boiler, it forms a single space. There is no closing element included that could reduce the through-flow capacity for the ash. The combustion has been optimised on the basis of a vacuum pressure in the combustion chamber and according to excess oxygen in the combustion products. The fuel feed and the movement on the grate is regulated according to the fuel characteristics. All measured parameters, interventions of the safety equipment and defects are transmitted to the dispatching system.